Edgar Allan Poe #LitLove: The Masque of the Red Death - fairy skeletons. Hello, everyone! 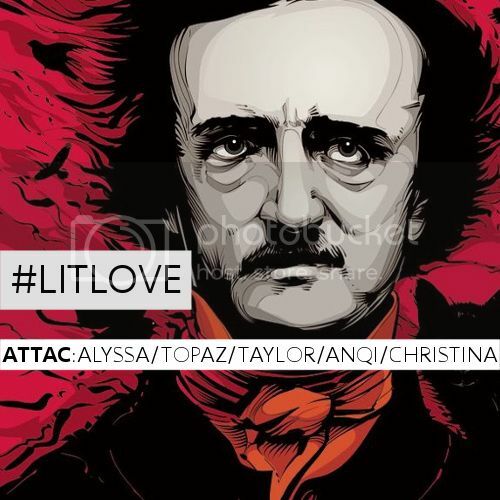 ATTAC is back (that is the coolest phrase) with our fourth round of #LitLove! Previously, we've featured brilliant middle grade authors Kate DiCamillo and Roald Dahl, as well as the peerless William Shakespeare. Today we're highlighting another classic writer—Edgar Allan Poe! Poe’s work as an editor, a poet, and a critic had a profound impact on American and international literature. His stories mark him as one of the originators of both horror and detective fiction. Many anthologies credit him as the “architect” of the modern short story. He was also one of the first critics to focus primarily on the effect of style and structure in a literary work; as such, he has been seen as a forerunner to the “art for art’s sake” movement. French Symbolists such as Mallarmé and Rimbaud claimed him as a literary precursor. Baudelaire spent nearly fourteen years translating Poe into French. 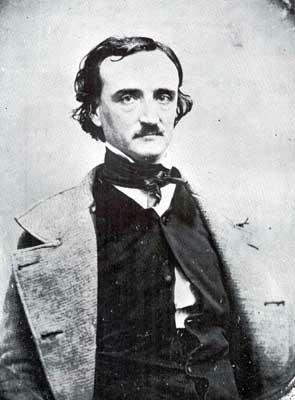 Today, Poe is remembered as one of the first American writers to become a major figure in world literature. I adore Edgar Allan Poe's writing, and there's so much retelling potential in all of his work I just can't. The mystique of the macabre, the tragedy that saturates the words, the smell of the grave. Magic, madness, malice. The doleful tolling of a funeral bell. There is just such a magnetism in Poe's particular brand of darkness. My favorite works of his include "The Tell-Tale Heart", "The Black Cat", "The Raven", "The Fall of the House of Usher", and the one I'm going to be discussing today, "The Masque of the Red Death". "The Masque of the Red Death" centers around a deadly, highly contagious illness called the Red Death (who would've guessed?) and the aristocrats who try to escape it. That has... consequences, to put it lightly. It's part of Poe's body of horror work, so it's maybe not for everyone, but its brevity and force have made it a classic American short story. In addition, it contains several elements of traditional gothic fiction, so it's a good study of that genre as well. Critics (and literature teachers, grr) often focus on the story's clear symbolism and allegorical undertones when discussing it. While I do think those elements are crucial and very well-executed, I'd like to elaborate more below about what I personally really value in "The Masque of the Red Death". The "Red Death" had long devastated the country. No pestilence had ever been so fatal, or so hideous. Blood was its Avatar and its seal--the redness and the horror of blood. [...] And the whole seizure, progress and termination of the disease, were the incidents of half an hour. That deep scarlet feeling of menace permeates and more or less defines the entire story. Poe's strong introduction makes you remember it even as the story goes on. But right after that horrifying paragraph about the effects of the Red Death, Poe launches straight into describing the practices of Prince Prospero, who rules the country being ravaged by the disease. As a both a reader and writer, I was immediately struck by Poe's powerful use of contrast. Prince Prospero has walled himself up in a magnificent palace filled with nobles from all over his kingdom. He's throwing decadent, ridiculous parties to ignore the reality of the devastation in the outside world. Within the frame of this particular story, Prospero has decided to host a masquerade. All of that immediately sets up tension that Poe is incredibly skillful at manipulating with his characteristically stunning writing. There was much of the beautiful, much of the wanton, much of the bizarre, something of the terrible, and not a little of that which might have excited disgust. To and fro in the seven chambers there stalked, in fact, a multitude of dreams. And these --the dreams --writhed in and about, taking hue from the rooms, and causing the wild music of the orchestra to seem as the echo of their steps. [...] in them [the rooms of the palace] beat feverishly the heart of life. That tension is just stretched and stretched and stretched until it snaps, and that's part of this story's brilliance. There's this thin line that Poe isn't afraid to walk on—between life and death, between lovely and rotting. This is enhanced by his work with the many-colored rooms in Prospero's palace, as well as the symbol of the ebony clock. There's so much great foreshadowing and so much that is beautiful and strange and frightening. This story means so much to me because not only is it practically a textbook in the short story craft, but it's also just spellbinding in its execution. There's so much potential in it, and so much horror, and so much elegance. I can't recommend it enough. Read the story. Do it, if you will, "for the aesthetic." Also, I want to do a retelling of this so badly, but it's already been done in the YA world. SEND HELP. Topaz @ Six Impossible Things spotlights Poe's poem "The Bells". and AnQi @ Moonbeams in a Jar discusses Poe's last complete poem, "Annabel Lee". * Unfortunately, Taylor won't be participating in this round. Oooh, having Poe's complete works sounds lovely! I totally didn't know about that bit of history, so that's interesting. Perhaps Poe based it on that? I don't have enough background to know, but I think it'd certainly be worth looking into. Oh, Christina, what a lovely post. You've summarised so well what makes "Red Death" one of my absolute favourite Poe stories - the way he uses tension not just as a plot device, but as a fundamental instrument of horror is simply stunning. And the ending. The ENDING. You know, this was one of the first Poe stories (after "The Tell-Tale Heart") I read on my legendary search for the author with the terrible hair, and I think it's what cemented my love for, er, *that* kind of ending. (I'm trying not to give anything away to hapless readers of the comments, but you know what I mean.) It's well-planned and, more importantly, flawlessly executed. Oh my, even I haven't realised it's been half a year. *excitement* And my goodness, you make Masque of the Red Death sound even more chilling than I originally thought it. "for the aesthetic" is definitely a great way to describe basically all of Poe's works -- he makes horror sound so beautiful that I want it. PS: Seriously, don't let other YA retellings stop you. There are like two hundred retellings of Cinderella out there. DO IT. Well, it was my pleasure to help introduce you to Poe! (Teeth-shattering is a fabulous way to describe his writing, imo.) Thank you so much for the kind words about my post—I can only hope that I at least somewhat did Poe justice. Happy reading, and thanks for your comment!